I’d viewed the ridge from a couple of angles and it had imprinted itself in the back of my mind. One for another day, I’d thought. I hadn’t imagined that the day would begin with an airport drop-off at Heathrow, nor that as I later drove along the A55 in the spray, looking at the invisible Carneddau, that it would yield such wonders. In recent times, I’ve become familiar with the pre-dawn routine of dragging myself from the pit, being warned to take care – before Jo returns to the land of Nod – and wondering, for the first ten minutes at least, what on earth I’m doing. Usually, the dark drive to the foot of the mountain is a chance to look for silhouettes and gauge the clouds but today, four and a half hours after leaving Terminal 3, the rain is coming down in sheets, it’s 10.30 am and 3000 feet isn’t a very appealing prospect. Jo and Charlie have landed in Prague, I can barely see Beaumaris across the Lafan Sands. Pete makes tea. His art is captivating and strong, his tea is functional. This Jones household in Sling eschews ‘te tramp’ (tea made with the bag in the mug) for the headier brew of the pot and whilst delicate it may be, it lacks the thrust of my preferred ‘bag left in’. I still drink two mugs, though. We catch up on the usual stuff, football and family, politics and people before turning our attention to the matter at hand. Pete is easy. He doesn’t mind. The weather forecast, even now as the squalls rattle on the roof, still says that it will clear, so we drive to Gerlan, park discreetly at Gwernydd and boot up for the afternoon. It’s June, it’s warm, this is summer rain and even if we get a soaking and tramp into the heartlands, what’s the worst that can happen? Behind a rock, on a grassy shoulder, we take our first break. It’s now noticeably colder but you’d expect that at around 2300 feet. The little lake just below us, drifts in and out of view, the giant walls of Carnedd Llywelyn, the ones that hold snow well into the summer, must be there somewhere, because it seems dark and even though visibility is poor, it’s impossible not to feel hemmed in. I haven’t been to Cwm Caseg for many years. The first time I looked at the ridge, it was from the summit. I noted that whilst it looked a bit steep immediately below where I stood, it looked like a fine prospect. The second time was from Foel Grach when I looked at it end-on and thought it was a must. At this moment, a breeze whips up, stirring the clouds and we’re agreed that a coat might add a little useful protection. 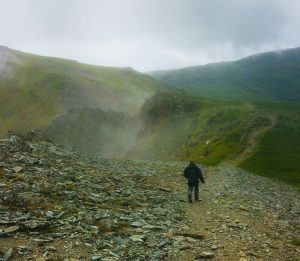 When we were in the narrows, twenty minutes ago, I saw some figures up on the slope where we now stand and as we begin plodding up a green bank with scree on either side, we can hear the odd shout in the wind and rain. Before too long we’re on the ridge proper. As we take a left and follow the crest, the ground sweeps away steeply on both sides and the wind, as Hendrix might have put it, begins to howl. As we are buffeted by the elements, the ridge steepens and the plunging slopes take on an air of the spectacular. Visibility is poorest as we near the top. We wait a moment to determine the best, or at least the safest, way to scramble the last rampart and in the end it’s an easier pull than it looks and we haul ourselves onto the summit of Yr Elen. Would it have been better in clear conditions? Possibly. Was it a great feeling? Definitely. We have caught up with a party of four in full gore-tex regalia and exchange pleasantries about the weather. One bemoans the forecast but I’ve looked directly above me (cheated if you like) and predict that it’ll be clear in less than half an hour. Pete and I have a drink of water and draw breath. The rain has stopped. For less than a minute, fleeting glimpses of things other than the inside of clouds, tantalise, until in one final gust the weather forecast comes true. No gradual lifting of the cloud base, no clearing shower or persistent hanging on to the high tops – the wind drops and the muggy vapours are gone. We watch the last scraggy, lonely streamers fly across to the east and stand to survey the glory of my favourite place on earth. The instantaneous beautiful weather presents us with a dilemma. Had it stayed grim, we’d have plunged straight down the ‘front’ of the mountain and found somewhere easy to cross Afon Llafar – the car in under an hour – but Carnedd Llywelyn demands an audience and from there, will it be Carnedd Dafydd or Foel Grach? We settle for the latter, reasoning that the long curve over Gwenllian, Yr Aryg, past the Beras and over Gyrn Wigau, will, by nature of its gradual descent, be easier on the knees. Skirting the walls of Cwm Caseg, we overtake the foursome, cheerfully reminding them of our meteorological expertise. They could do with losing a few layers. It’s warming up in the June sunshine. On Carnedd Llywelyn the wind blows again…or rather the wind blows as it always does across this humbling stone-scape. We pause at the highest point and an anxious man, who may have been looking for this spot for some time, approaches to claim the summit. He has an intense look. On Yr Elen’s east ridge, no matter the conditions, it is up or down. 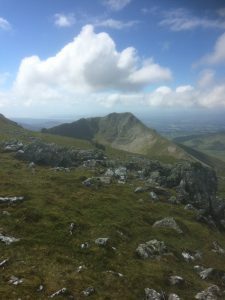 If the anxious man left Foel Grach into the teeth of the gale – in the clouds – for a while the track would be true but once onto Llywelyn’s lofty plateau, only a well-taken bearing, or years of familiarity, would make certain of the top. His direction of approach suggests that he went a little to the right but he’s made it now. He says a clipped, gruff, hello and we leave him to it. The remainder is a breeze. We bowl along to Foel Grach and from there to Gwenllian. It used to be called Garnedd Uchaf and it never used to count but now it’s a bona fide 3000er and The Gurkha soldiers that sprint the Welsh 15s must divert across its top. Not much of challenge, that. The air is fresh. There are no cars within what – four or five miles? In fact, Pete’s, in Gerlan might be the nearest. We pick up the old drover’s path that slants down towards Drosgl, leaving the Bera castles for another day and leave it to spring over Gyrn Wigau and down to the lane. From the summit of Carnedd Llywellyn to Gerlan, we have seen all of Anglesey, Llandudno peeping through the low hills, Afon Conwy, matchstick wind turbines in the sea, Yr Wyddfa, Shropshire, Pen Llyn, Glyn Garth on The Straits, Maesgeirchan, the Pier and of course Penrhyn Quarry and the ugly grey box of the Pennants, plonked in its woods, a monument to greed. It’s been a good afternoon and we have enjoyed a moider supreme. From the moment we left the anxious man, all the way to the High Street in Gerlan, we never saw a single living soul.